With so much being announced by Google over the last 6 months in their advertising arena, certain aspects of it can be easily overlooked. As advertisers are slowly forced to upgrade to the new Google Ads experience, they’re being introduced to new features that never existed. One of these new features in the new interface and experience is custom-intent audiences. I believe this new feature is to combat the migration of advertising from the Google Display Network to Facebook where audience definition reigns supreme. Facebook provides a tremendous amount of granularity while the Google Display Network (GDN) has been very limited by comparison. 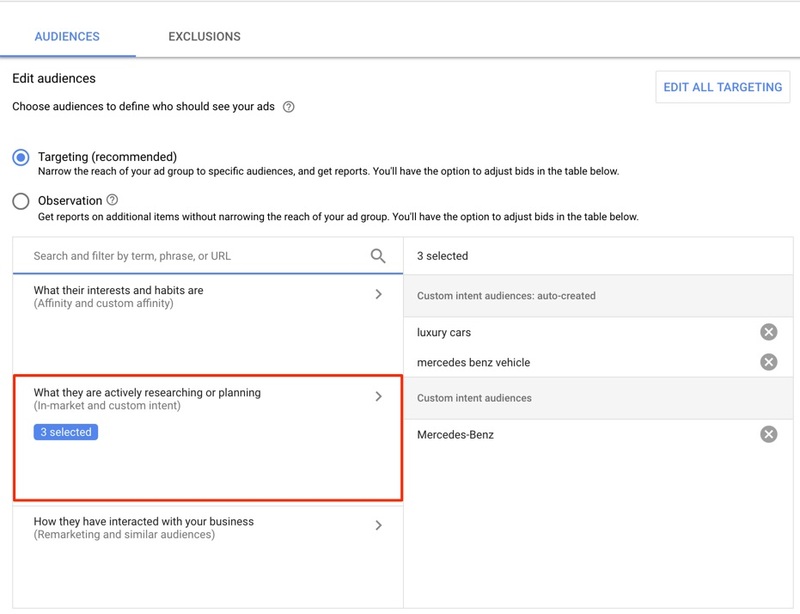 On the GDN, Google is enabling dealers to target people who want to buy specific models — based on data from a dealerships campaigns, website, remarketing lists, keywords and other 3rd party websites. You may not know who is on your website, youtube channel, or who’s on your remarketing lists, but Google does. With all the information available to Google, you can start creating some very specific highly targeted audiences for your display campaigns. Google does all the heavy lifting, you provide some guidance. There are two types of custom intent audiences. The first option is, dealers can create their own based on keywords and URLs that people who are likely to be interested in a model search for and visit. The second option is machine-learning based, automated for you. Google Ads will create an audience based on several different things. It can create custom intent audiences based on your website, on your search traffic, your remarketing lists, and your youtube channel. The benefit to custom intent audiences is you no longer have to use the built-in pre-defined (and sometimes limited) audience definitions, you can build your own. Until custom intent audiences were around, a very good option was predefined in-market audiences (automotive related), but limited by either body type or OEM without any real geographical information. 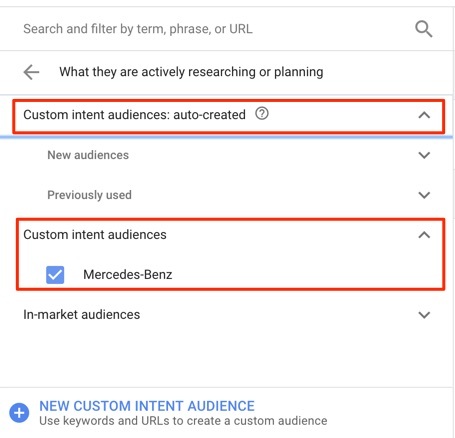 A Mercedes-Benz client went from the GDN defined in-market audience “Mercedes-Benz” to using a custom intent audience created ourselves for Mercedes, this lowered their cost per conversion by 22% simply by changing the audience (with all else remaining the same). You can find custom intent audiences on the audiences tab while viewing a display campaign. When you select the highlighted option above where you can select from in-market and custom intent audiences, you’ll be presented with your intent options, selecting some auto-created audiences, selecting your own you previously built, or the option to create a new one. Being given more granularity is always positive, that way we’re not sticking to the same predefined ‘general’ options of the past (improvements). As Google continues to include more machine-learning with its massive amount of data and providing that to advertisers, it can only continue to get better. Our early results suggest these custom intent audiences are the absolute best targeting for a dealership to date from the GDN. We look at our cost per goal completion (comparing apples to apples) of custom intent audiences vs. the built-in audiences and they’re all performing better from a cost per conversion standpoint. If you haven’t poked around the new Google Ads experience, you should – it has these great options + so much more (and you’ll be booted from the old one soon enough).